Simon & Schuster, 9781451642636, 432pp. The inside story of the small group of soldier-scholars who changed the way the Pentagon does business and the American military fights wars, against fierce resistance from within their own ranks. "Thrilling reading. ... There is no one better equipped to tell the story. ... Kaplan, a rare combination of defense intellectual and pugnacious reporter … knows the military world inside and out. ... An authoritative, gripping and somewhat terrifying account of how the American military approached two major wars in the combustible Islamic world." "One of the very best books ever written about the American military in the era of small wars. ... Fred Kaplan brings a formidable talent for writing intellectual history." "The Insurgents is a tremendously clear and informative guide to the strengths and weaknesses of the military we have today and to the decisions we are about to make. … Anyone who reads The Insurgents will be better prepared to understand what America has done right and wrong with its military over the past generation." "Excellent ... An intellectual thriller." 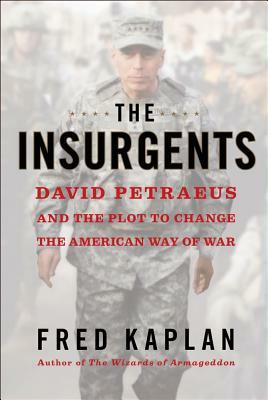 "Riveting...essential reading... Kaplan's meticulous account of the ways Petraeus found to bring together and nurture the counterinsurgency 'cabal' might profitably be read by anyone interested in bringing change to a giant bureaucracy." "A very readable, thoroughly reported account of how, in American military circles, 'counterinsurgency' became a policy instead of a dirty word." "A compelling story combined with thoughtful analysis of the development, application and limitations of a new model of applying American military power." "The book's strength lies in the rich detail Kaplan offers the reader as he traces the network of colleagues all dedicated to stopping the violence in Iraq by employing classic counterinsurgency techniques. He untangles the web of professional connections much the same way an intelligence analyst might track down the associates of an al-Qaeda cell... What emerges is a meticulously researched picture." "A fascinating and powerful work by America's wisest national-security reporter about an epic battle: the Army's search for a way to win the wars of the 21st century. If you love your country, if you care about its soldiers, if you wonder about the wisdom of their commanders, read this book now."